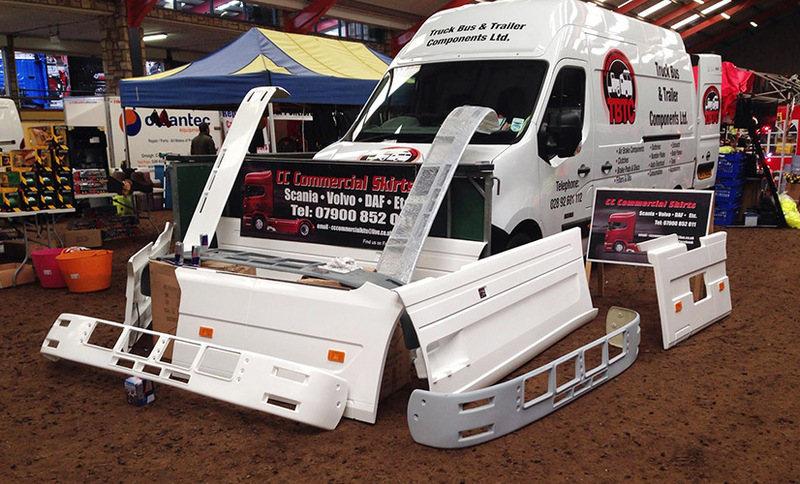 Already firmly established as one of the island’s premier independent designer, manufacturer and fitter of side skirts and wind kits for all makes of trucks, CC Commercial Skirts Ltd service has just got even better. We dropped into the company’s busy workshop in Coalisland, County Tyrone and touched base with founder / proprietor Gerard McCourt to discuss the improvements he has made to take his market-leading operation to the next level. Manufacturing a wide range of high-quality side skirts to suit all makes and models of HGVs – from Scania to DAF and Volvo to Mercedes-Benz – and serving local, national and international markets, CC Commercial Skirts Ltd had carved such a comfortable niche for itself in the industry when last we spoke to Gerard McCourt in 2015 that one would readily have forgiven the Coalisland man for easing up, with the business established and performing superbly well. Instead, to the contrary, the ambitious, meticulous, customer-orientated entrepreneur has rolled up his sleeves and adapted a proactive approach, with a view to further improving his products and services, ensuring that his exceptional self-built enterprise continues to go from strength to strength. The business is making tremendous progress on the back of providing exceptional products and services, culminating in rising demand through repeat custom and positive referrals. It would be fair to say that the trucks fitted by CC Commercial Skirts Ltd are show-stoppers, as they have regularly picked up top awards on the truck show circuit. K Mackin Transport Ltd.’s striking flagship T-Cab and the two stunning, brand-new, state-of-the-art, high-spec Volvo FHs acquired earlier this year by Hastings Transport in Cavan are just a couple of the head-turning vehicles to have received the much sought after CC Commercial Skirts Ltd treatment. Gainful employment is generated for a crew of six, although Gerard is on hand around the clock to keep a very close eye on everything. For the owner, it’s a real labour of love, with each and every job overseen, signed off and guaranteed by him personally. Every job is afforded the utmost care and attention.